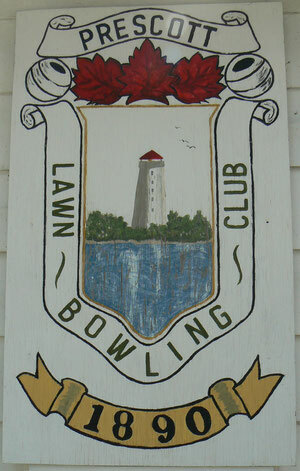 About Prescott Lawn Bowling - Website of prescottlawnbowling! 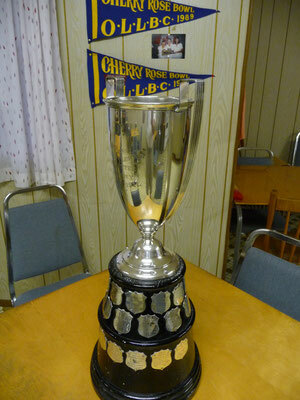 The "Red Letter Trophy" was provided by J.P. Wiser and Sons Limited in 1911. This beautiful cup was used from 1911 through to 1957. The "winners plates" include many teams from Ottawa, Cornwall, Brockville, Iroquois, as well as the names of several of Prescott's notable families. The pennants in the background are examples of the many on display on Prescott club house. Many were brought in by Marie Simpson who is a current member and always willing to explain the game to new members, and show them 'how it's done'.